This Chocolate Covered Cherry Martini is like dessert in a glass! 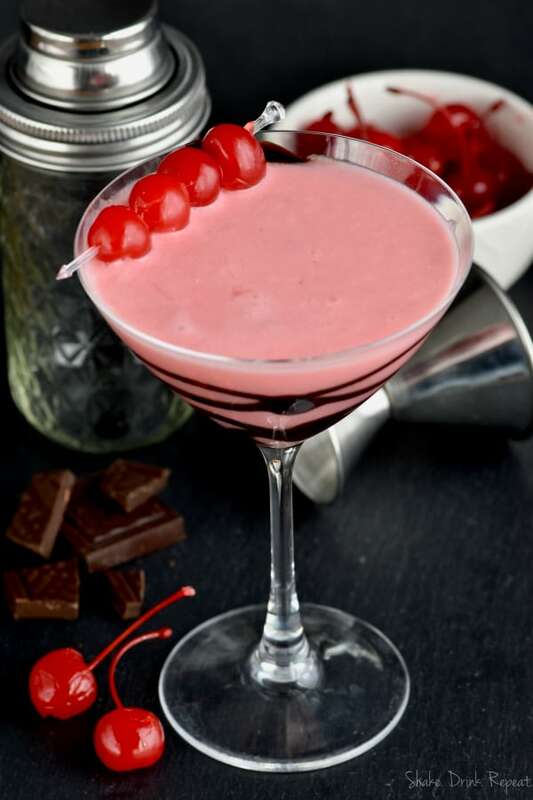 A chocolate cherry kiss martini made with cherry vodka, creme de cocoa, grenadine, and heavy cream. The glass is drizzled with chocolate syrup, and then four cherries sit perched on the edge to give it the look of a high end drink that comes together in minutes. 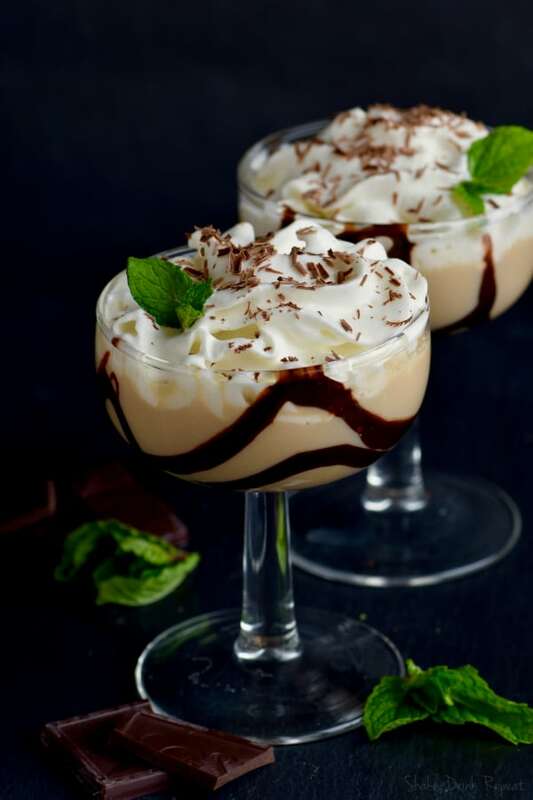 If you are looking for more drinks to pour in your martini glass and call dessert, try this Eggnog Martini, Samoa Martini or this Rolo Martini. 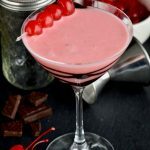 If you are looking for a fancy and delicious drink for Valentine’s Day . . . . or just a random Tuesday night, make this Chocolate Covered Cherry Martini recipe! It tastes just like a chocolate covered cherry. It is smooth, creamy, and tastes like dessert in a martini glass. It is sure to impress! WHAT GOES IN A CHOCOLATE COVERED CHERRY MARTINI? 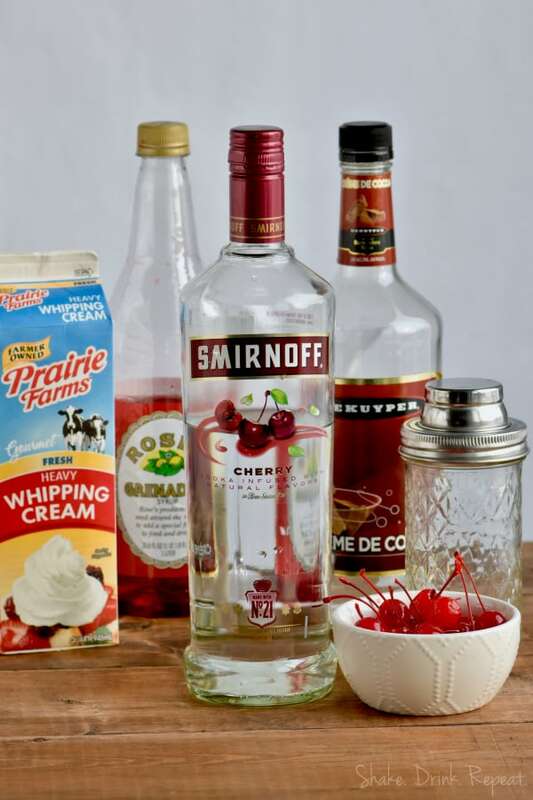 This cocktail starts with cherry flavored vodka. It is a nice way to add the cherry flavor, without watering down your martini. Then you add creme de cocoa, a sweet chocolate flavored liqueur. Add some heavy cream to get that nice smooth creamy texture to the drink. Finally, you add a little bit of grenadine to make that great cherry color. HOW DO YOU MAKE A CHOCOLATE COVERED CHERRY MARTINI? Combine all the ingredients in a martini shaker and shake to combine. Before pouring, drizzle chocolate syrup in the martini glass, swirling the glass while the syrup drips, to get it to cover the glass. We recommend a high quality chocolate syrup that is some what thick, like Ghirardelli. If you are looking for more dessert martinis, make sure you look this Peanut Butter Cup Martini, this Chocolate Martini, and this Toasted S’mores Martini! This Chocolate Covered Cherry Martini is like dessert in a glass! 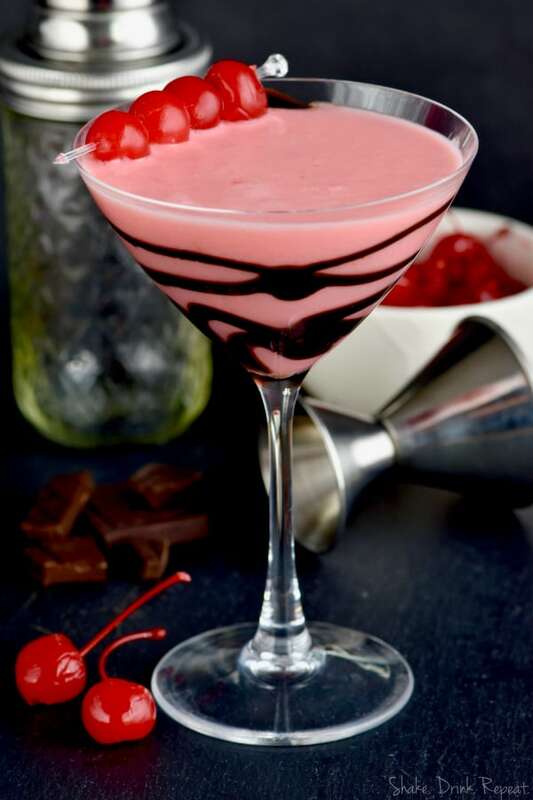 A chocolate cherry kiss martini made with cherry vodka, creme de cocoa, grenadine, and heavy cream. Combine all the ingredients in a cocktail shaker. Shake to combine. Drizzle the chocolate syrup in the martini glass by holding the syrup steady and spinning the glass slowly by the steam. Slowly pour the drink into the martini glass. Garnish with cherries. This is so pretty looking and romantic and festive all in one! I MAKE A PRETTY MEAN CHOCOLATE MARTINI, LOOKS LIKE I’M GOING TO HAVE TO TRY THIS ONE TOO…..LOOKS PRETTY TASTY! I hope you love it Teresa! 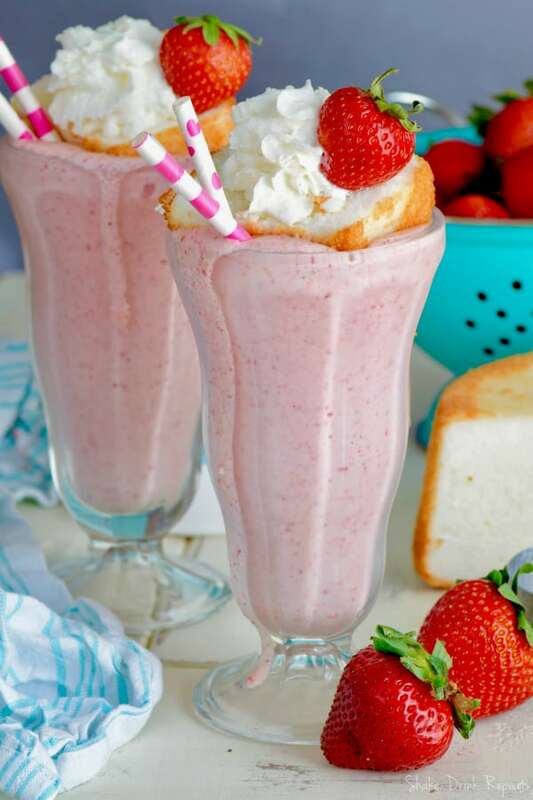 This is so pretty and sounded so yummy I thought I would make them for Valentines dinner for me and my husband… Even bought the cherry vodka and grenadine, already had the creme de cocoa…. What I failed to realize, as I was making a “practice Martine” tonight, was that my CDC is chocolate, as in brown! While not as pretty as your picture, the taste is still yummy! Can’t wait to share with my husband!